OpenVSwitch Bridges are not compatible to this Linux Bridge, then we’ve defined on our architecture a pair or interfaces called qbr and qvo. 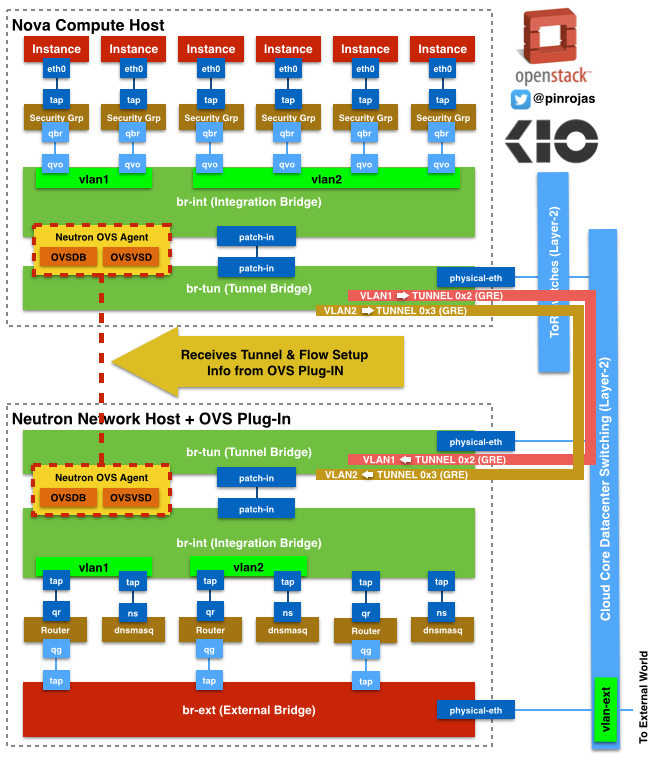 qbr is directly connected to the Linux Bridge and qvo is connected to the Integration Bridge. The Integration Bridge is part of the OpenVSwitch solution and it’s responsible to tag and un-tag with VLAN IDs all network traffic come in and out from/to the instances. Also is responsible to communicate all the instances that belong to the same tenant or lead the traffic out the Tunnel Bridge and then to external network components. Tunnel Bridge (br-tun) is connected to the Integration Bridge (br-int) through the patch-in interfaces. The OpenFlow rules about how to setup the traffic in the tunnels to run on top of the br-tun. the tunnels are defined through GRE and there is an association between every VLAND ID and a GRE Tunnel ID. 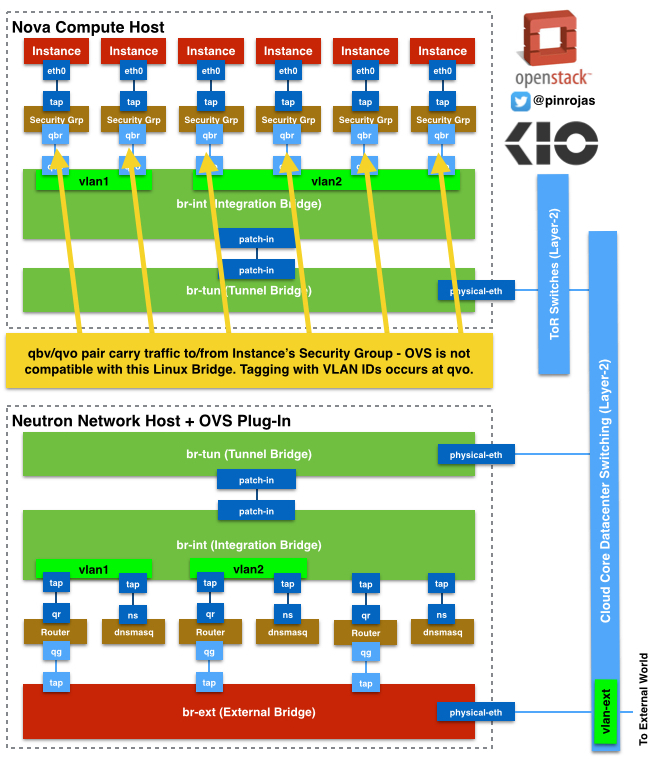 You don’t need advanced licenses for Routing, GRE, Security… all these components are provided by Neutron and OpenVSwitch. There isn’t lock-in with any vendor – at least you start using some specific plug-ins to manage some control features by hardware or specific appliances -. Then, you are able to use product for different known vendors that can offer a powerful data backplane to transport an big amount of data with the lowest latency. 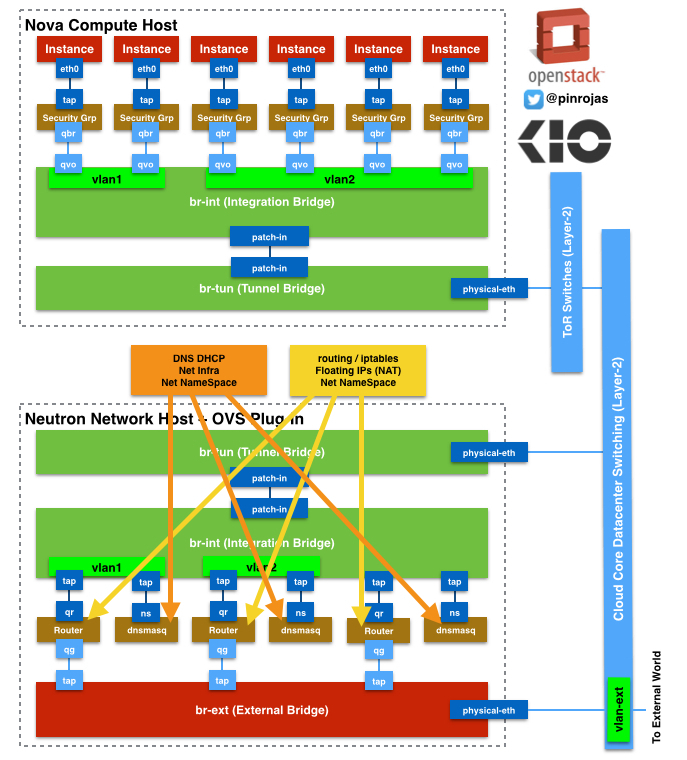 Neutron Host or Hosts are independent servers where all the more advanced network service and components are running (Routers, DHCP, External Firewalls, etc.). All the traffic to the External Network (or Internet) through the GRE tunnels from the Nova Servers ends at the br-tun defined by Neutron Hosts. br-tun has the OpenFlow rules that define the match between VLAN IDs and GRE Tunnels IDs, and all this conversion processes, between VLAN and GRE, occurs at this bridge. This Bridge is connected to the integration bridge (br-int) inside Neutron through the patch-in interfaces. As the Host Node, br-int is un-tagging and tagging the traffic, but in this case, to/from routers and dnsmasq resources. routers and dnsmasq are independent namespaces with their own Linux Network Stack. Namespaces helps to manage traffic with overlapping private IPs between different routers associated to different tenants or projects. Routers helps to route traffic between tenant’s subnets and also to/from the external World. Also routers are using Linux iptables to filter traffic and also to make floating IP works through NAT (Network Address Translation) to chosen instances. dnsmasq is also working on a Linux Network Stack with DHCP and DNS processes serving exclusively to the associated tenant. Neutron is containing router, basic/advanced network and security services, then almost all data goes through these hosts. size these servers with as much memory you can. Memory is the most used resource for this processes. Consider to have at least two server with equal configuration, to use one of them as stand-by for any issue on the main one. Well, this is it, see you next time! What a great post, amazing! Congratulations. Excellent !! Really very good artical . Diagrams are Awesome. If possible can Can you share the coding flow of this . Awesome information.. cleared confusion regarding OVS and Neutron.. Thanks for this detailed explanation of Neutron’s components. 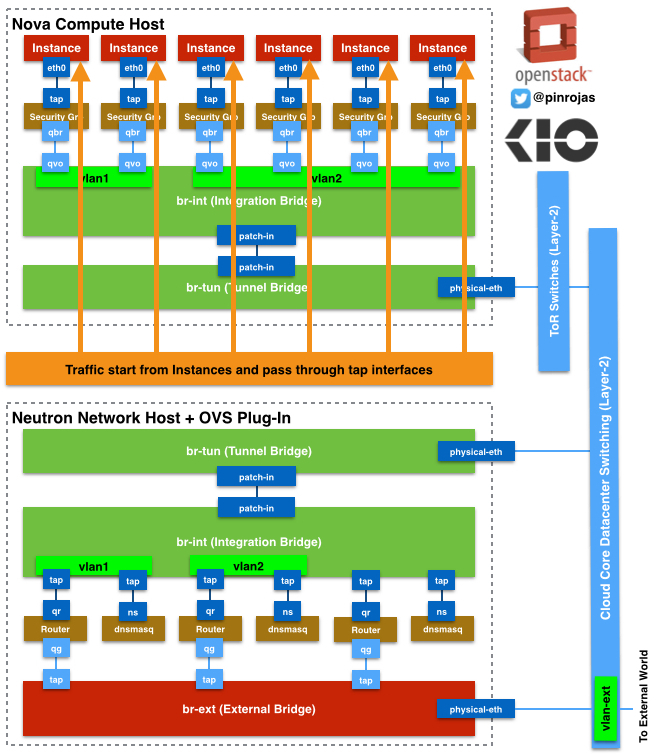 Over at VirTool Networks we have been working hard to lower the bar for understanding OpenStack networking with our visualization and troubleshooting tool. 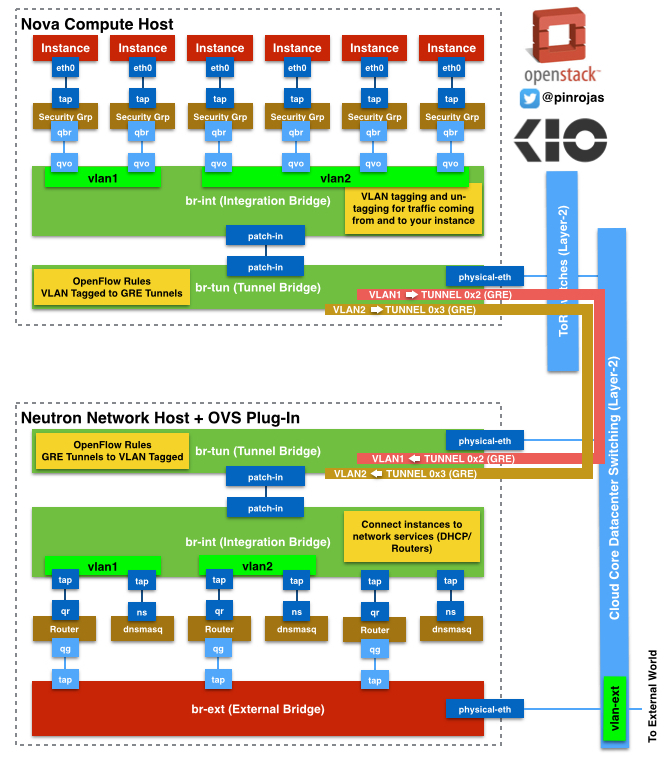 We would love you to have a look and see what you think as we are committed to making life much easier for OpenStack users! 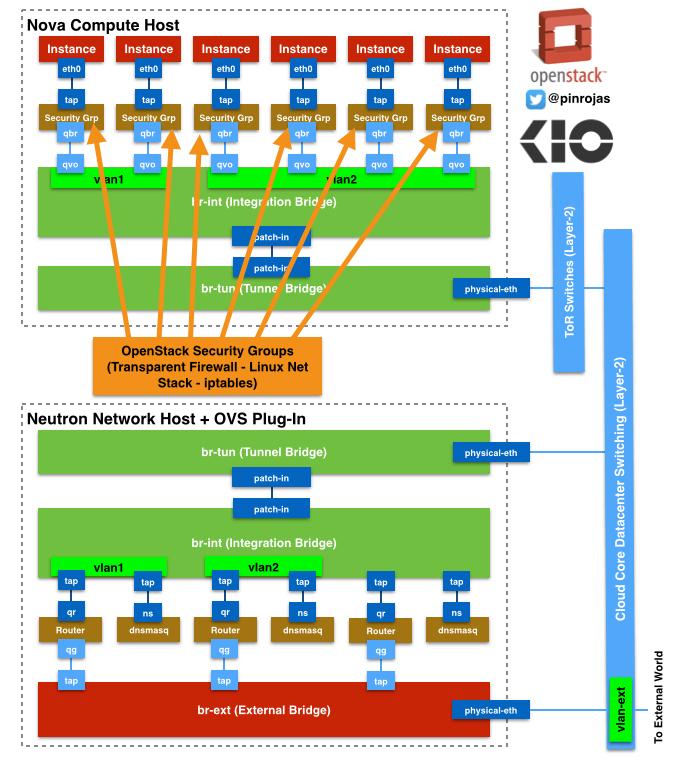 Previous Previous post: Is Openstack a new Hypervisor or what is really?